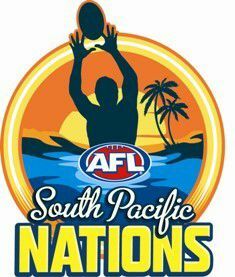 Days 3 and 4 of the AFL South Pacific Cup played out yesterday (Wednesday) and today (Thursday) at the Tony Ireland Stadium in Townsville. The Papua New Guinea Binatangs lived up to pre tournament favouratism and completed an unbeaten run through the tournament to take out the title. Unbeaten by a whisker though after the draw against Oceania on Tuesday. Upon the completion of the last match on Thursday, the 30 player squad was selected to take on the Kickstart Flying Boomerangs at 9 am tomorrow (Friday) morning. This initial squad will be reduced further to 25 to compete in the NAB AFL U/16 national championships to be held in Sydney in July. See separate article for the squad. * Fantastic game of hard and tough football in the wet conditions. Very physical match, which provided some great highlights during the game. In the end Oceania stood strong to kick 2 late goals and win the match 14 points. * What a terrific way to finish. The PNG mosquito fleet ran extremely hard and jumped NZ early to be 5 goals up at half time. NZ fought very hard. But found it hard to compete at ground level. NZ worked hard to bring their tall’s into the game and competed very well across half back. The Binatangs slipped away early, with Nane Rai (Lae) snagging the first major before Eddie Gavuri (Hoskins-Islands) blew the game apart with 5 of the next 6 goals. Port Moresby's Kataha Siwee at centre half forward was a commanding target and at the other end the defence was held together by Ben Tirang (Mt. Hagen). In the slippery conditions, PNG were on top in the clearances and able to expose NZ with their spread which unleashed superior speed and skills. The midfield was solid with the likes of Greg Ekari (Gerehu Magpies-Port Moresby), Gideon Hauta (Taurama Suns-Port Moresby), Kila Rawal (Bomana Cats) and Jeremiah Tirang (Mt.Hagen) all impressing. Congratulations to the PNG Binatangs on winning the 2013 South Pacific Cup.